The new Eldar codex was released with a great howl from the Warp, and much wailing and gnashing of teeth from the Internet at large. Would tournaments simply ban the codex? Is it true that if my buddy brings Eldar, he has a 2+ roll to win the game (rerollable if he has a Farseer)? If my wife plays Eldar, do I have to divorce her, and if so, who gets our corgi Guilliman? 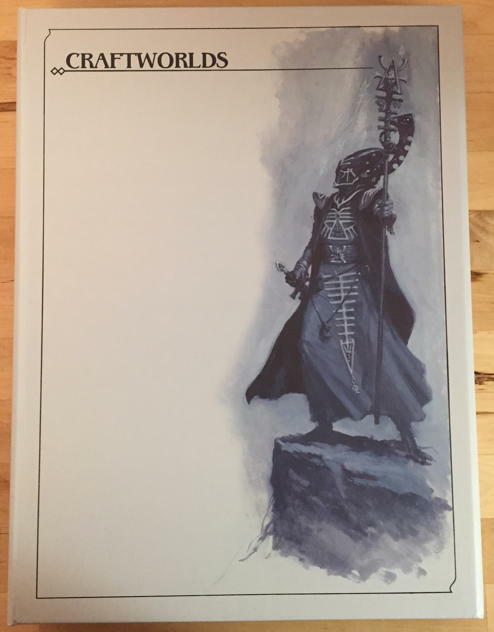 I’ve finally had a chance to sit down and read it, and my thoughts on the codex, in the form of what I’d like to think is a pretty in-depth review, is forthcoming in a series of posts, the first of which, on fluff, aesthetics and all the “soft factors” that keep you wistfully going back to a Codex long after it has been rendered obsolete. The second will be on the actual mechanical contents of the codex, and the third my thoughts on playing the army, and how it meshes with the other Eldar forces. 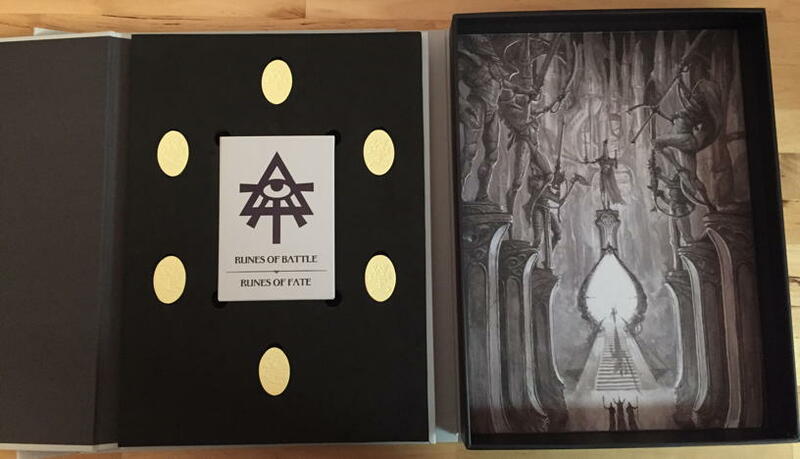 If there was one Codex (besides, perhaps, Sisters of Battle…) that I was going to buy a collectors edition of, it’s this one. When I fell in love with the Eldar as an army, I fell hard, and now it’s indisputably my primary force. But I’ve rarely seen a review of the actual content of a collector’s edition book beyond “Probably Not Worth It”, which in all honesty is kind of self-evident. If you’re buying purely for game content, please buy the standard stuff. Timing. I pre-ordered this an hour after it hit the Games Workshop site. By lunch, they were gone. Yet I only got this on April 30th, well after the regular edition was available in stores. And it shipped via FedEx Smart Post, which has been, in my experience, both glacially slow and utterly incapable of producing those nice surprise deliveries a couple days early. The objective markers, which will probably see use after the codex is obsolete, fall a little flat. I know they’re going for a wrathbone look, but instead it comes off as an oddly amateurish resin cast. If someone were playing with them, I’d ask where they came from, and be surprised when I found out they came from this. They’re just…lacking. Speaking of lacking…the Eldar get new tactical objectives. The Eldar get a new set of datacards with said tactical objectives. You’ll note I haven’t taken any pictures of subdued blue tactical objective cards. That’s because there aren’t any. 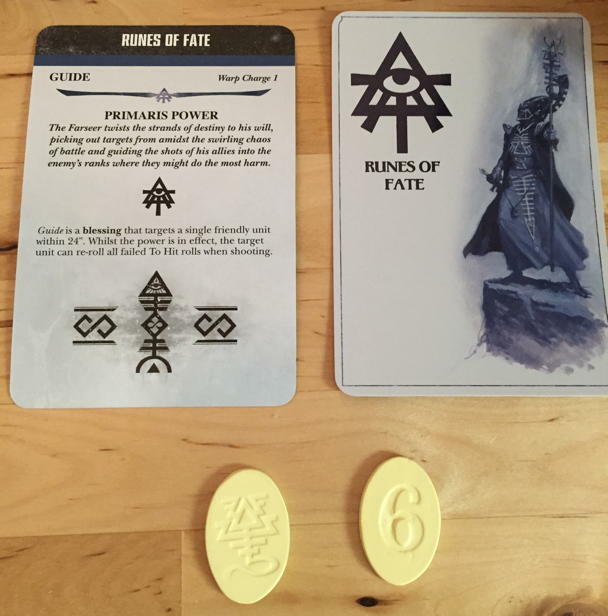 You get the psychic disciplines, but not the tactical cards – meaning if you want them, you have to order a full set. And with the delays in shipping these, there’s a non-zero chance they’ll be sold out, since Games Workshop seems to still like the idea of limiting the supply of high margin gaming accessories. That one is genuinely annoying – a collectors edition, especially one meant to stand alone like this, should be complete. Overall, for the collectors edition packaging and goodies? A for effort, C+ for execution, ending up at a middling B. Good, with tantalizing tastes of greatness, but it falls short. Onto the codex itself, and content that will be universally applicable regardless of what version you bought (except maybe the ePUB one…)! First, the book is beautiful. Games Workshop has, in my mind, really upped their publishing game, and while the books remain fairly expensive, at least I have some faint feeling of where my money is going. Yes, there are some companies that make bigger books for less money (hey Fantasy Flight), but then I also pay subscriptions for some academic journals that are into the hundreds of dollars and don’t even print in color. Remember kids, it could always be worse. One of the great parts about the Eldar is they have a really rich and vibrant backstory, which has been being fleshed out for decades now. And what that means is that now single codex, save perhaps a Fantasy End Times-style “Rocks fall, everyone dies” reboot is going to usher in a massive reboot. But the fiction writing still feels…fresh. I like that they’re pushing an emphasis that the Eldar aren’t fading off into the good night quietly, they’re going out with a technologically superior bang that the lesser races will long remember (should they live through the experience). Whoever wrote this really likes the Eldar story, and it shows – it also shows in the mechanics, as we’ll get to in Part 2. The art is also a refreshing combination of new and old, bringing back some of the classics along with some new art, both of which still look right (you can tell the new stuff via redesigned bikes and the prevalence of Crimson Hunter/Hemlock Fighters). The Valedor campaign, which I reviewed here, is folded in seamlessly. 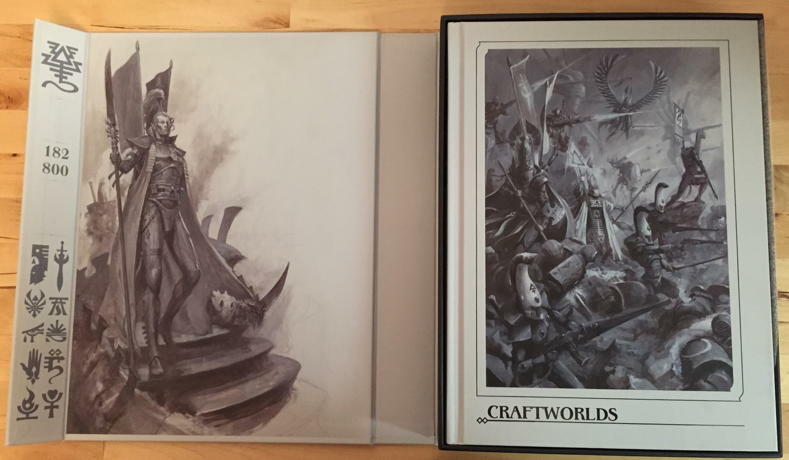 Each of the major Craftworlds gets a full two-page art and story spread, which is excellent, and the minor ones (Lugganath, Yme-loc, etc.) get their time in the sun as well. I was however saddened that there wasn’t more exploration of two of the Aspects that don’t have a detailed Phoenix Lord: the Crimson Hunters and the Shining Spears. I’ll admit, I really like the idea of a Phoenix Lord whose armor is a space fighter in ways that are difficult to describe, but there’s not a mention. And the Shining Spears are way more established, and still…nothing. Even a fluff mention, with no new models – or sinister hints at the noted absence of a Phoenix Lord – would have been nice. There’s also a large portion of the codex devoted to some full color plates of Eldar warriors that are pretty lacking, in the old Forge World style of “And here’s that same tank, but now in green!”. Do we really need several pages worth of Saim-Hain figures painted in solid red, with slightly different face plates and little runes painted on them? Or Aspect Warriors all painted the same colors with marginally different accent highlights? I’ll give them credit for trying to manage a few Eldar-style camo schemes, but they just came off as garish and weird, rather than either stealthy or badass. The exception was the Biel-tan section – it once again reminded me how sad I am I can’t seem to manage to paint compelling thorny vines. But overall, the second just felt like it was stalling for a few pages to pad things out in an otherwise very well done presentation. Similar to the collectors edition, I’d give the fluff and aesthetics section of the book a solid B/B+ rating. Glimpses and potential for greatness, but there wasn’t anything really compellingly new, and the color plates, while they were new, somehow managed to feel actively stale. Next post, we’ll be hitting the meat of the book: wargear, units, formations, and all the things that have made your local gaming group threaten to take its marbles and go home! If you enjoyed this, and would like to see more of it – along with other positive, quantitatively (for the most part) driven thoughts on the 40K universe, please consider supporting the Variance Hammer Patreon campaign.